Could a government scheme give the UK’s high streets a much-needed facelift and bring people back to live in them? 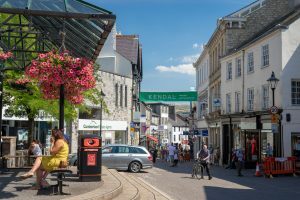 The 2018 Budget included an announcement that a ‘Future High Streets Fund’ would be set up, armed with a fund of £675m. Local authorities were invited to apply for portions of the fund, and the signs are that there has been a substantial response ahead of the closing date of 22 March. There has been a general decline in the British high street for some time, with out-of-town shopping developments taking footfall away. Smaller chains and independent shops have been hot hard, but recent years has seen a swathe of big names also affected – Debenhams, HMV, BHS and many other established brands have struggled. As a result, the sight of shops lying empty has become sadly familiar. And along with former shops, spaces above them have also been emptied, but one aim of the fund is to help move towards such spaces become residential units. The 50,000 shops that lie empty were dubbed the ‘biggest untapped resource for new residential development in the UK’ by a recent survey. Converting shops and the spaces above them into homes could help address the housing shortage to some extent. Around 1,000 applications to the fund were made in the first three weeks. Local authorities can bid for up to £25m per high street and are expected to match the amount they are allocated. Berry insists that the emphasis of the high street needs to shift away from just retail. In addition to homes, theatres, gyms, GPs and child care centres are called for. It’s a move that has brought industry approval. A recent survey by MRI Property stated that 72% of property professionals felt that the fund would give the high street a new lease of life. Altrincham, just outside Manchester, is held up as an example of a failing high street can be transformed. The Cheshire town, a popular choice for commuting into the nearby city, had 30% of its shops empty in 2010. But after an award of £40,000 kickstarted a change with an emphasis on food and culture, resulting in the town being named as having Britain’s best high street in 2018. It’s a much-improved place to shop, eat and be entertained in, and could be an example of how to start bringing people back to living in town centres. The post Moves under way to revive the British high street appeared first on BuyAssociation.